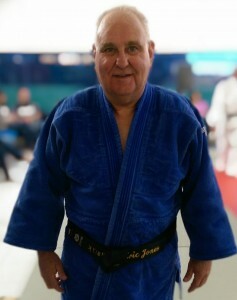 Len started Judo late in life in 1969 aged 28 at Basingstoke Judo Club under John Gowland as a bet. He became fascinated with the techniques and the mechanics of judo, and gradually crept up the various grades. He started teaching rolls and breakfalls to his son in his back garden on some foam mats covered with a tarpaulin, and they were soon joined by neighbours and friends on a Saturday afternoon ‘’ for a bit of fun,’’ which turned out to be the start of a very busy sporting life. Having gained his coaching certificate in 1981, Len was very busy with the running of Summit which had about 50 members and ran twice a week. Weekends were for competitions, Hampshire squad training or courses. Len gained his Personal Safety Advisors’ certificate and ran self- defence courses for ladies for Hampshire County Council alongside the judo club, during which time he studied for his black belt until he finally obtained it in 1991. In 1984, he became a judo referee and covered events for the southern area and the army. He has now retired from refereeing and spends his time at weekends with family or organising hosting for the Festival of Sport if there isn’t a judo course to be arranged or attended or a meeting to go to. Len is proud to have been nominated several times for ‘coach of the year’ and for ‘services to sport’ at the Basingstoke Sports Awards. He won the latter in 2015 and was also awarded his third dan. I think he won the bet that said he was too old for judo. 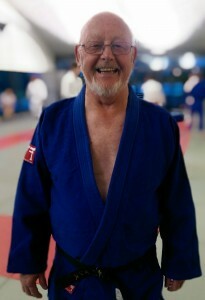 Paul started Judo in 1983 at the Age of 6 at Summit Judo Club with Len Dunce and Derek Brownett. At the age of 13, due to his parents moving away, Paul left Summit, only to return at 21 (1998) with little brother on tow as an excuse to play judo again. Since then, Paul has worked up the belts again to become a club coach in 2004 and black belt in 2009. He takes lessons for both junior and senior judoka. Paul now voluntarily teaches judo 3 nights a week. 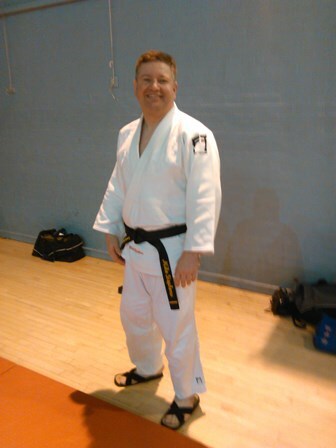 You can find him at Summit Judo club on Fridays – and on Mondays and Wednesdays at AWE Judo club in Tadley, where he initially began teaching only to help injured-coach Al Coupland. He has taken over Al’s role. Since August 2010, Paul has turned professional by starting up Summit School of Judo gaining another 150+ students and enhancing his role by being BJA Hampshire Chair 2011-2016. In 2016 won the Award for Professional Coach of the Year in Basingstoke and Deane Sports awards. Eric Started Judo in 1974 after he took his sons to Basingstoke Judo Club (run by John Gowland) to help with bullying that they were experiencing at school. At the time, Eric was a keen footballer but had so much fun at judo that he hung his boots up to concentrate on improving his judo. Over time, he has helped many students – including his sons – to progress further in judo. Mark is currently a 1st Kyu and Paul has represented Great Britain, is a 2nd Dan Professional Coach and still competes. Eric joined Summit J.C. in 2001 when he returned to Basingstoke after 11 years in Devon where he ran several clubs in that time. Eric has been a full time Professional Coach for the last 10 years. 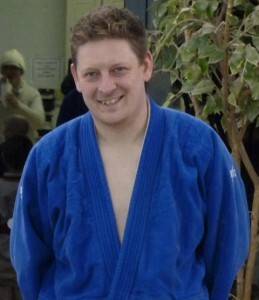 Running Eric Jones Judo Academy, he teaches in schools around the Reading area 5 days a week. He also finds time on a Friday to help teach the Junior and Senior sessions; some weekends he referees at various events on a voluntary basis. Mike is very secretive about how he started judo. Some people say he began in order to support “his lovely daughter”; others say he was hired by a gang of unruly, teenage, mutated turtles.